Curd Any Time:Enjoy homemade dough or curd anytime of the day with the Fermentation Function, which utilizes advanced fermentation technology to set just the right temperature, providing your family with even more options for deliciously fresh meals. Utilize Every Inch: Experience greater flexibility with the MW5000H Smart Oven. Designed with busy families in mind, you can disable the turntable to utilize every inch of interior space, which mean easy accommodation of large square dishes. A step above similar appliances, now you can easily heat larger pans and casseroles quicker, leaving more time to enjoy meals around the table. Banish Food Odors: Strong odors wont linger inside the Samsung MW5000H Smart Oven. Simply select the Deodorisation setting to force interior air outside to dissipate. This feature quickly eliminates any bad smells so your food tastes as fresh and delicious as intended. Enjoy Local Tastes: Choose from a wide variety of pre-programmed local recipes on the Samsung MW5000H Microwave Oven and enjoy familiar flavors with the simple touch of a button. 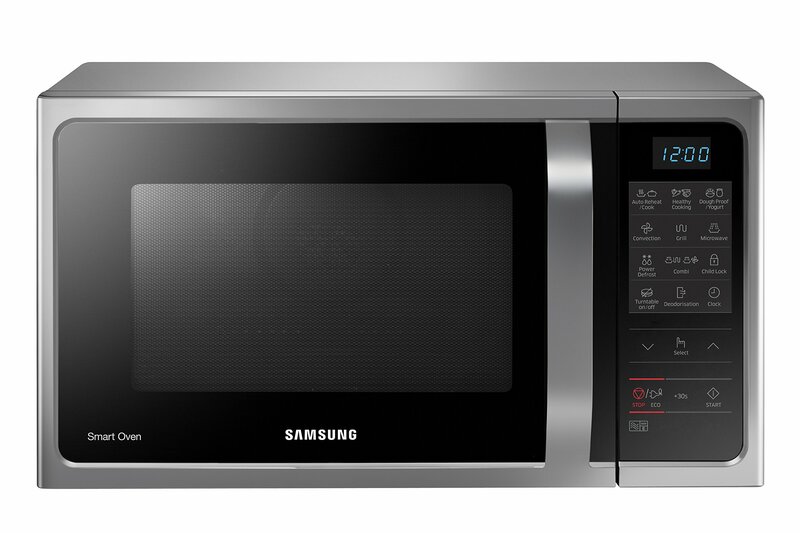 Superior Ceramic Interior: Samsungs MW5000H Microwave features a smooth ceramic interior that is easy to clean and wont scratch or discolor over time. The anti-bacterial and scratch-resistant interior is made to last. Save Money with ECO Mode: The ECO Mode setting on the new Samsung MW5000H Microwave Oven offers the lowest standby power consumption, significantly reducing power usage to save on energy bills.